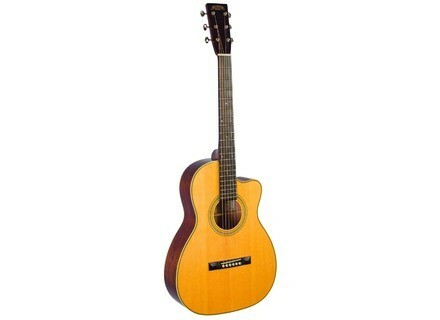 RP2-626, Other Acoustic Guitar from Recording King. The two new models will be a classic single 0 parlor size cutaway, and a 00-size with a cutaway body. The Recording King parlor guitars (RP1-626 and RP2-626) offer players "the even frequency response, clarity, and wider neck traditional to a classic parlor style, but the unique addition of a cutaway gives fingerstyle guitarists easier access to the upper frets," the company says. On both the RP1-626 and RP2-626, the one-piece mahogany neck with a classic v-profile meets the body at the 12-fret with a hand cut dovetail joint. The solid AAA Engelmann spruce top and solid mahogany back and sides have been selected and hand-assembled. With a 1-3/4" nut width, Grover tuners, ebony fretboard, and ebony pyramid bridge, these parlor guitars are sprayed with a thin coat of nitrocellulose lacquer and then hand-buffed for a finish. The RP1-626 and RP2-626 models have a MAP of $999.99 and have a lifetime warranty. For more information, check out www.recordingking.com. Axl Guitars Badwater Pro Series The AXL Badwater Pro is the company's response to requests for a Badwater guitar with upgraded professional components and hardware, AXL says.